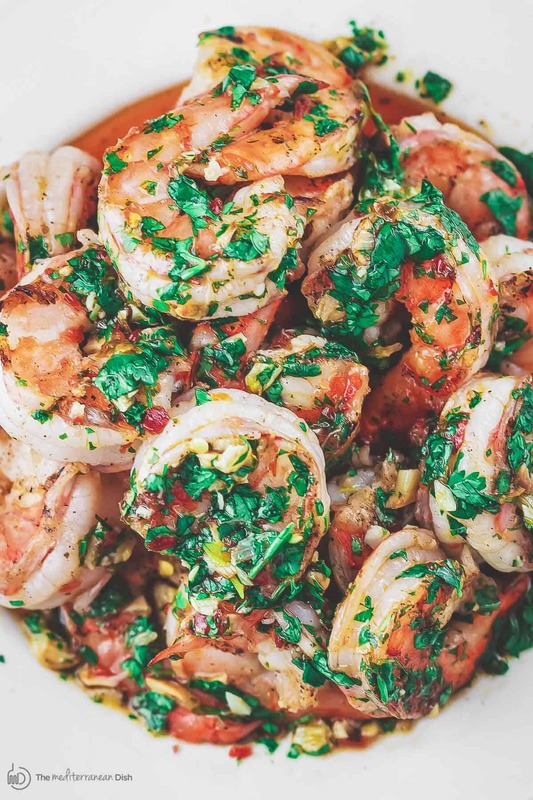 A quick grilled shrimp recipe with a special Mediterranean sauce. Makes a great appetizer; or serve it for dinner with rice or your a favorite pasta! See the step-by-step tutorial below. 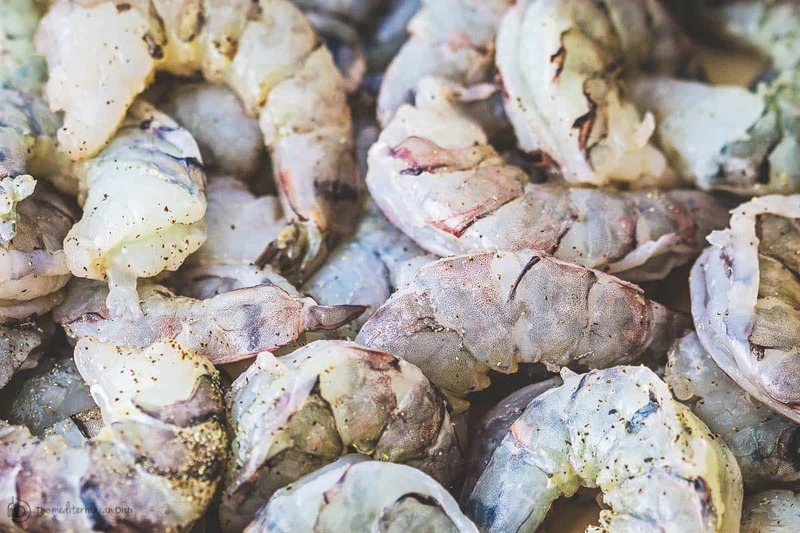 Where I grew up, a shrimp recipe–or any seafood recipe for that matter– is deemed successful only if it had loads of garlic. 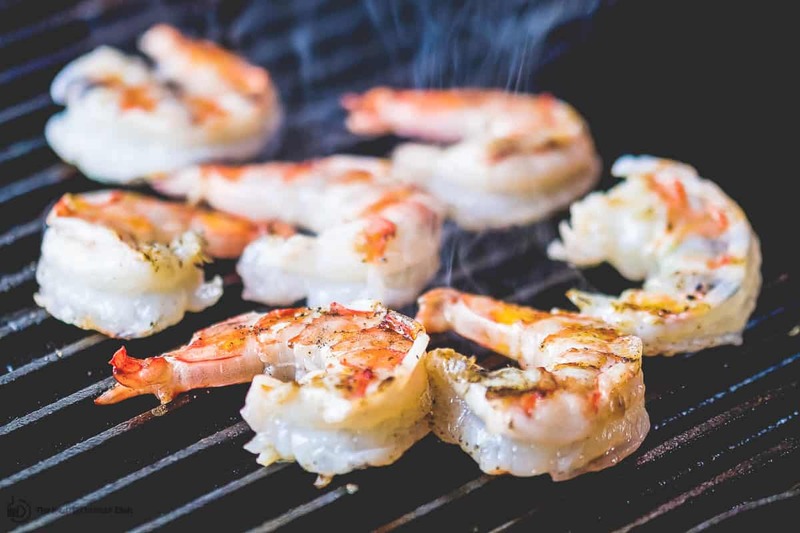 Today’s grilled shrimp recipe does begin with garlic–a whole head of it, in fact. But, I’m taking more of a modern Mediterranean twist with it. First, to tame it’s pungency, the garlic is roasted whole. The added bonus here is the hint of sweetness and earthiness that is brought to life when garlic is roasted. 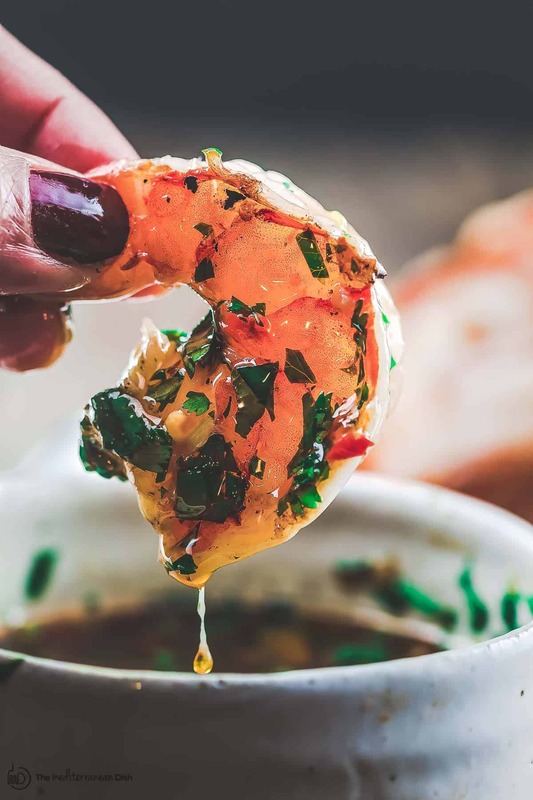 The mellowed roasted garlic and fresh cilantro become the main ingredients for the sauce in which the quick grilled shrimp will immediately bath! 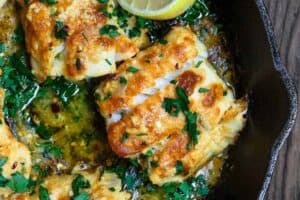 A combination of lime juice; white wine; and good extra virgin olive oil completes the sauce. And a little chili paste adds a spicy kick. 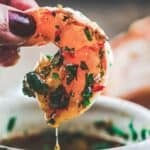 What to serve alongside this grilled shrimp recipe? This grilled shrimp is great served tapas-style with your favorite crusty bread, along with other small plates like this fattoush salad; creamy hummus; or fried eggplant and green peppers. Browse our “Small Plates” section for more ideas. To serve it for dinner, make sure to double (or even triple) the amount of sauce, and toss in your favorite pasta to complete the meal! Preheat your oven to 400 degrees F (you’ll need the oven to roast the garlic). Peel, devein and rinse the prawns. Pat dry with a paper towel. Season with salt and pepper. Place the prawns in fridge until ready to grill. Trim top of the garlic head off; leave the garlic intact and do not peel. Drizzle with a little olive oil. Roast the garlic in the 400 degrees F-heated oven for about 10-15 minutes or until slightly tender and fragrant. When ready, remove from oven. Let cool briefly. Peel and crush or chop the garlic finely. 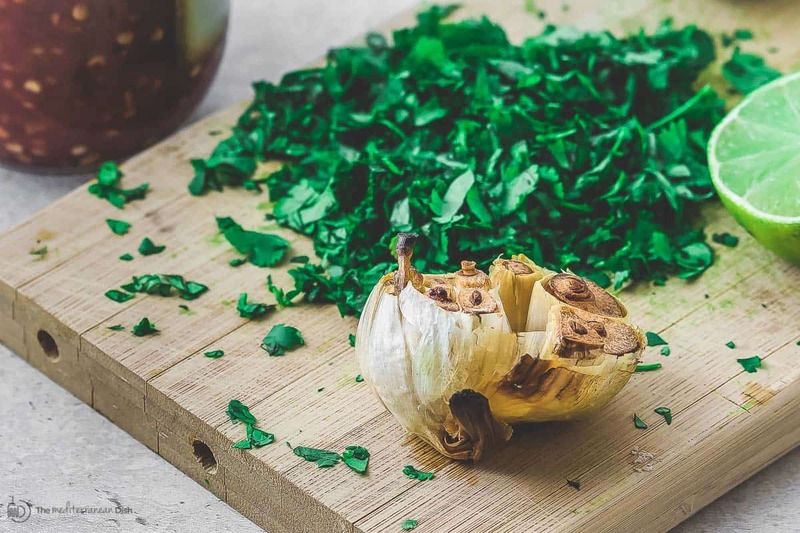 In a small bowl, combine the garlic with the cilantro leaves, lime juice, white wine, olive oil and chili sauce (or chili flakes). Whisk together and set aside. When ready, heat a cast-iron grill or griddle to medium high. Dress the prawns with some olive oil and grill for 3-4 minutes or so on each side. You want to achieve some char, but be careful not to overcook. 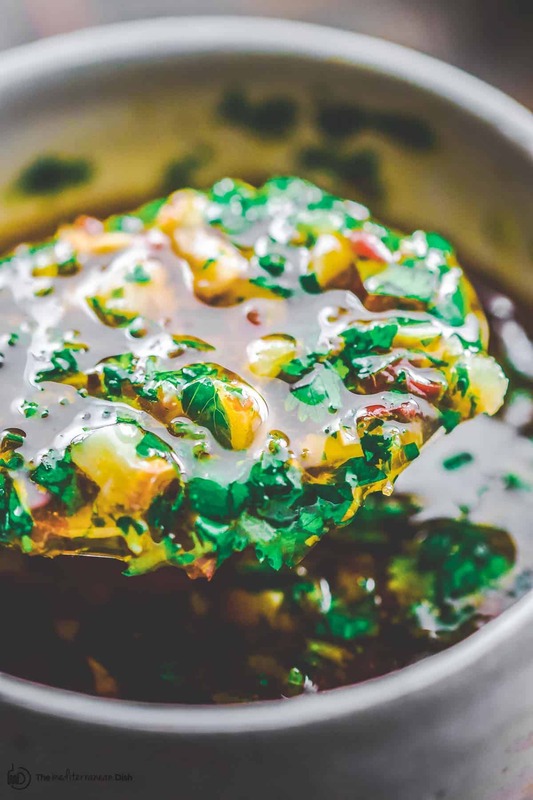 Remove from heat and coat the prawns with the roasted garlic and cilantro sauce. Alternatively, serve the sauce on the side instead. 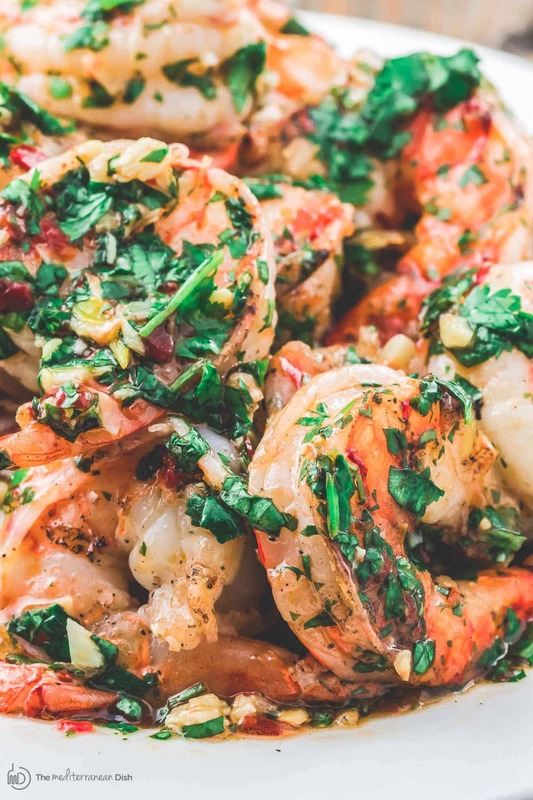 Easy Mediterranean style grilled shrimp with roasted garlic cilantro sauce. Perfect as an appetizer, or double the sauce and toss it with your favorite pasta! This was really filled with flavor. Family loved it. – I marinated the shrimp in salsa verde prior to cooking. – Shrimp kebabs over the grill. – Tossed with your absolutely incredible cilantro garlic sauce – definitely 5 stars – and served over quick-sauteed zoodles. Thanks so much for sharing, Scott! Love these ideas! Ahh! The best recipe I’ve ever had. Just loved the dish with a small amount of salsa and some fresh tomatoes. Thanks a lot for sharing the wonderful recipe with us. I made this for my husband and I tonight and it was so delicious! It’s also simple to make! Awesome, Benita! This is one of my favorites ! Made this last night and it was delish! I doubled the sauce but kept the chili at the same amount (thank goodness because it was spicy), used 4 heads of roasted garlic and tossed it with some spaghetti. Make sure to add a little pasta water to help create a sauce like consistency. It was amazing! Awesome, Jen! I am so glad you enjoyed it! 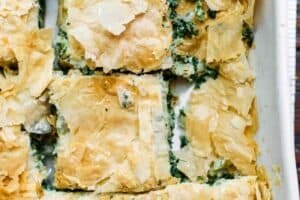 I made this recipe and it was fantastic!!! My husband and I were licking our fingers! So flavorful and addicting! I made babaganush with garlic naan and a tomato cucumber salad. We had a crisp Bolla Soave and that was our Saturday date night at home! Thank you for such a delicious recipe? Made this shrimp dish….delicious!!! The dipping sauce was excellent. put it on a bed of zucchini noodles! I also made the fatooush salad.Thank you for a great salad! 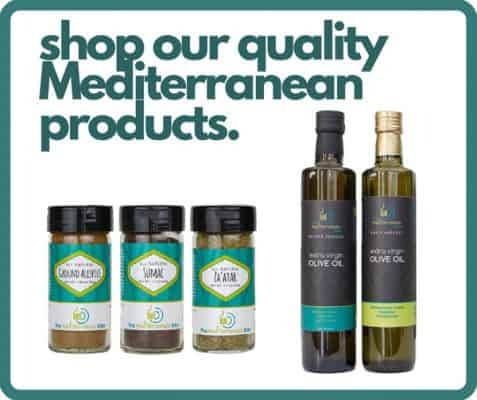 Maureen, thank you so much for trying this and the fattoush! Two of my favorites! Love the idea of zucchini noodles. Yes I made this too on Father’s day. Served it as an appetizer. THey loved it. Our eldest son left with copies of your recipes. Yes I’ll be making it again. It was easy! Awesome, Michele! Thank you thank you for the kind feedback! Great recipe. Made it last night and served it with a salad. Healthy and tasty. Awesome, Arron! This is always a hit at my house too. Hi Lindsey, so the dry white wine is a very small amount here. 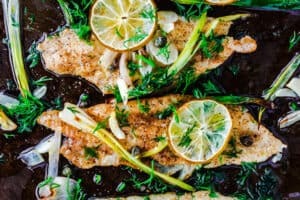 You can substitute with a white wine vinegar. Or you can omit the white wine adding more lemon juice and olive oil. Enjoy! We had some leftover savory mushroom steel cut oats risotto and were looking for a prawn recipe to compliment it. It didn’t take long to find your recipe; we typed ‘prawn recipe’ into the search engine and then looked at the photos… yours was the clear favourite. We made the dish last night and absolutely loved it. We’re going to have the leftovers on pasta tonight and think it would be perfect on homemade pizza too. Thanks so much for posting. Hello, Zahra! Thank you so much for your question. I have been away from my office and just now am able to connect my laptop, sorry for the delay. Yes, you can eliminate the wine here, and I would simply adjust the lime juice and olive oil to your liking to compensate for the missing 1 tbsp wine. Or, you can use 1/2 tsp mild vinegar such as white wine vinegar and adjust from there. Enjoy! Hello David! Yes, your idea to sub the white wine for more lemon juice and a little honey would completely work here! thanks for sharing! This was SO good. My husband couldn’t stop commenting on it. And thank you for posting a link to the chili sauce you used. I was thinking of using a Cajun hot sauce but the quantity had me concerned. Clicked on the link and realized that I had the same sauce you recommended in the fridge. My husband also suggested that I use your sauce recipe with scallops. We served this tonight with barley (cooked with Rotel tomatoes and cheddar cheese) and a caesar salad. Carol, thank you so much for taking the time to share! The sauce would be great on scallops as well…Good idea! The recipe looks simple enough, but there are so many types of hot sauce, what do you recommend??? 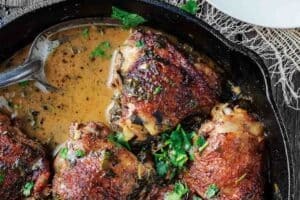 This was really flavorful, easy to make, and light (so you don’t feel terrible after eating it!) I added chicken with the shrimp and almost liked the chicken better since is soaked up more flavor. I love anything with cilantro! Wonderful to hear! I like that you added chicken…I’ll have to try that sometime! Hope you find more recipes to try. Jacquline, thanks for stopping in! Isn’t cooking salmon in foil so easy. If you try my salmon baked in foil, let me know how you like it! Our new favorite dish!! 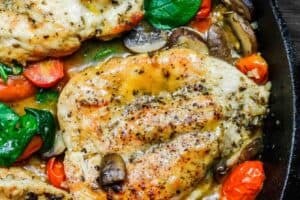 The sauce is amazing and so easy!! Do you happen to post the nutiritional information anywhere?